adidas Athletics joins the fight against marine plastic pollution by releasing the first-ever Parley weave adidas Z.N.E. Hoodie made with Parley Ocean Plastic™ yarn. Parley is a global network where creators, thinkers, and leaders come together to raise awareness for the beauty and fragility of the oceans and collaborate on projects that can end their destruction. adidas and Parley joined forces in 2015 and among the many activities supporting the implementation of the Parley AIR strategy, the two work together to transform plastic intercepted from beaches and in coastal environments into high-performance sportswear. Collectively they spin the problem of marine plastic pollution into a solution, the threat into the thread. adidas Athletics now proudly joins the cause with the release of the first Parley weave adidas Z.N.E. Hoodie Parley, to create awareness and inspire a cultural shift in behavior to protect the future of the sport, and the planet. Featuring French swimming athlete Coralie Balmy and Brazilian swimming athlete João de Lucca, the new campaign features both swimmers in an urban swimming environment. In featuring two swimmers who are renowned for their passion for the water and environmentalism, adidas Athletics aims to inspire others to choose products with a higher purpose. Rooted in sport, born from culture and shaped by style, the brand-new adidas Z.N.E. Hoodie Parley is built for purpose and redefines eco-innovation in the sport. Featuring a fully-fashioned knit, the new hoodie has a highly adaptable fit and is made out of Parley Ocean Plastic™ yarn for lightweight comfort. 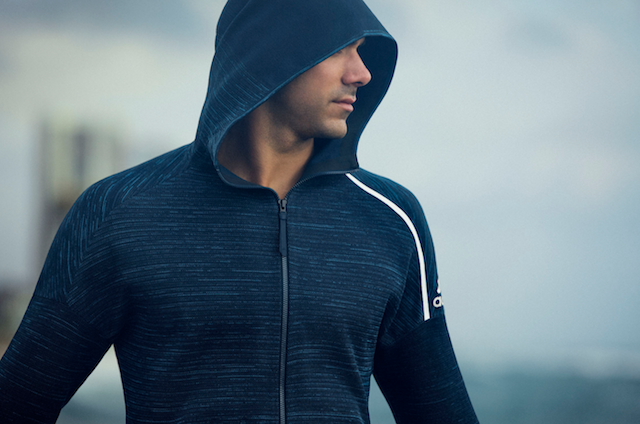 Engineered using body-mapping techniques, the hoodie features a precise knit structure for zoned ventilation, flexibility and stretchability, so athletes can move comfortably and with ease on and off the field of sport. The adidas Z.N.E. Hoodie Parley is already available for $180 on www.adidas.com and in adidas stores worldwide. To find out more, please visit adidas.com/us/athletics_zne. Follow the conversation at @adidas on Instagram, Facebook, and Twitter and using #ZNE #adidasParley or if you have any questions please feel free to contact us contact@brawopress.com. About adidas Athletics: adidas Athletics mission is to reinvigorate and revolutionize the badge of sport as an object of desire. It recognizes the need for athletic expression off the field of play, whatever the field of play. Bridging the gap between athletes’ style and their life of sport, it champions a unique and fresh point of view, celebrating and highlighting the untold stories of innovation that get under the skin of sport.